We’re flying home to London having spent ten days in Southern California. It’s been a pretty eventful day so far. We arrived early for our flight, stood in line at check-in and got to the front a few moments later. Just as we were called forward, we saw the police move in to our left - alerted to a suspicious package. They assessed the risk as our check-in agent processed us and decided to evacuate the terminal. We left calmly and walked outside, the decision to shove a couple of beers we had no checked baggage room for into our hand luggage delivered immediate pay off as we enjoyed more of the endless Los Angeles sunshine. Half an hour or so later, we were air-side. Suspect package dispatched with impressive efficiency and TSA in uncharacteristically good spirits as they checked our bags. We rock up the the first bar we find, scan the small beer list and order pints of Golden Road IPA with a side of nachos. The beer is fresh, crisp and delicious with a resinous finish that keeps on delivering. The nachos fill a hungry hole. A second round follows soon after. And there's time for a third before our flight is called. I recalled reading how Golden Road sold out to AB-InBev a couple of years ago but at that point I couldn’t care less. I could be facing Bud as my only choice and this is a decent IPA given the context of an airport lounge. A few days earlier, I was sat at the bar at Ballast Point. Sculpin was tasting the best I’d ever tasted it in five visits to the brewery in as many years. Their new tap room is positioned to the side of their (huge) new brew house a mile or two away from the original site. Service is efficient and polite. The beer is of exceptional quality, so far showing no signs of billion dollar big business moving in to throw their craft to the wind. I cast my mind back to the can of Camden Pale I’d had the night before we departed on this trip - I’ve never tasted it better. It had the same bright freshness as the Golden Road IPA. An incredibly accomplished brew that delivers remarkable consistency these days. Around the same time Golden Road were acquired, I decided to invest a few pounds in Camden Town Brewery as they were crowd funding. I had to overcome some internal conflict to make that decision. I had friends who worked there (and still do) and a lot of admiration for what they’d achieved in a few short years but their fierce protection of the "Camden" trademark in one case had come across as over-zealous. Despite that initial internal conflict, I was engaged with their brand and even had my Dad trying Hells over his preferred macro lager. A few weeks after deciding to invest, I was handed my money back, with a sizeable percentage return, as Camden Town ditched the crowd funding in favour of being acquired by AB-InBev. In effect, they'd been made an offer they couldn't refuse which made their crowd funding target look like pocket money. "Your stake just got a HELLS of a lot bigger!" read the snappy e-mail which was soon followed by legal documents talking about drag along notices - the legalese telling me that Camden had sold my tiny share on. I should’ve been happy right? But it felt like being unfriended on Facebook. I’ve no issue with small breweries (or any business) getting bigger through investment. That's the right of their owners to do what they believe is the best thing for their business and its long-term objectives. I’ve no issue with the staff at Golden Road, Ballast Point or Camden Town Brewery - they’re clearly doing great things as they always have. However, what are the intentions of AB-InBev and the other big beer corporations acquiring smaller breweries? Did they purchase these brands as as side-project? Can they be like, "keep on brewing the fantastic beer you’re brewing and let’s see how far we can support you (and maybe distribute it) as we fuel your independent growth with you in full control” whilst they simultaneously continue to aggressively acquire lines and stifle all competition at the volume end of the market? They're diversifying their portfolio in an increasingly competitive market. When one global brand in that portfolio starts to decline, another will be thrust forward ready to take its place. That's just business. 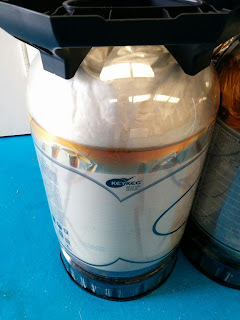 I had a few 30L slimline KeyKegs split on me after filling which, especially for our first kegged gyle, cost us a lot in lost revenue just when we needed it least. After tweeting about the problem I had a whole heap of helpful advice from other brewers who had been through the same, and on seeing these tweets, further advice directly from the manufacturer. This post captures that advice for the benefit of others as it helped me to (so far, at least!) eliminate the problem. First, to be clear on 'the problem', the photo below shows a KeyKeg where beer has leaked into the space between the bag containing the beer and the plastic outer. KeyKegs are dispensed by pushing gas into this space to force the pre-conditioned beer out of the bag. Technically the keg is still useable in the state shown but you'll probably struggle to get all of the beer our and of course, they can't be sold to trade looking like that. The problem seems specific to the newer slimline kegs. The old round ones don't seem to exhibit the same, at least based on feedback I've had. One cause of this problem is reported to be under-filling although apparently there are other causes too (not covered here). KeyKegs are filled upside down then turned the right way up once full. 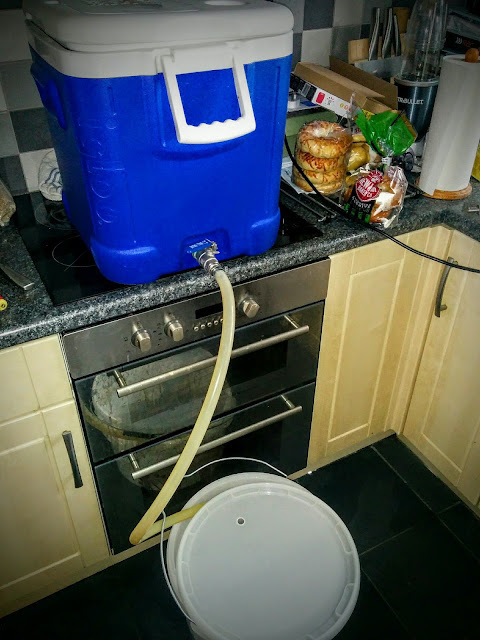 The theory is that if even slightly under-filled, once turned the right way up, the beer in the keg will pull down on the top of the bag as the beer fills the space that was at the top of the keg when it was upside down. I found that the ones I had split did so a day or two after filling whilst sat on a pallet undisturbed. 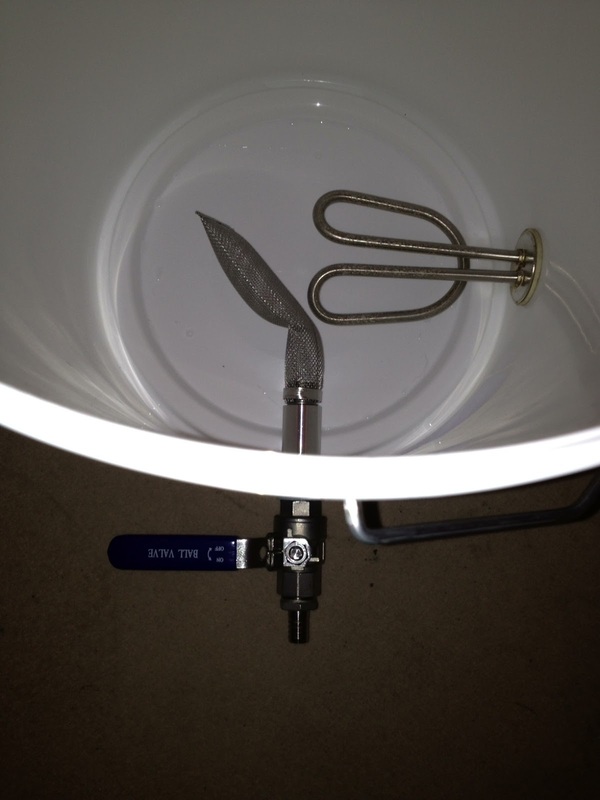 Ideally fill under pressure to ensure some force behind the beer as its pushed into the keg. That's KeyKeg's recommendation from the outset. Not an option for us without buying another tank, though. Ensure the keg really is full after filling. 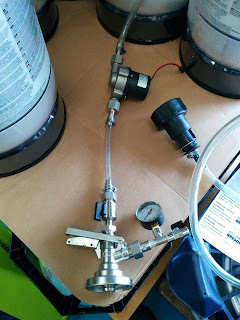 I played around with this a bit and found that I could get a few more grammes (or ml) by re-applying the head after turning the keg the right way up. They should weigh 31.4Kg when full, or thereabouts. The bag should be visibly 'full' with no gaps (other than small creases, this is expected) visible from outside the keg. Use a pump to assist when filling by gravity, to help ensure the keg really is full. Again, I played around with this by filling through a small pump (that was off) until the bag stopped visibly and audibly expanding then turning the pump on. This really helped get more beer into the keg and on turning the pump on I saw the bag visibly expand further to fill any remaining space. Since doing this, kegs are filled reliably to 31.4Kg and I've experienced no further issues with splitting. A photo of my filler setup is shown below. It uses a small DC mag pump (this one) in-line before the filling head. I turn the pump on after opening the filler valve and turn it off again after closing the valve after filling. This has the added bonus of filling the kegs about 2-3 times faster than by gravity alone. If anyone has any other tips or findings, feel free to share them in the comments below. I should note that some breweries have reported occasional failures both when filling under pressure or by gravity, even if the keg is entirely full. This should of course be referred to your supplier or the manufacturer directly. I'm only writing about my own experiences here which appeared to be caused by under-filling. 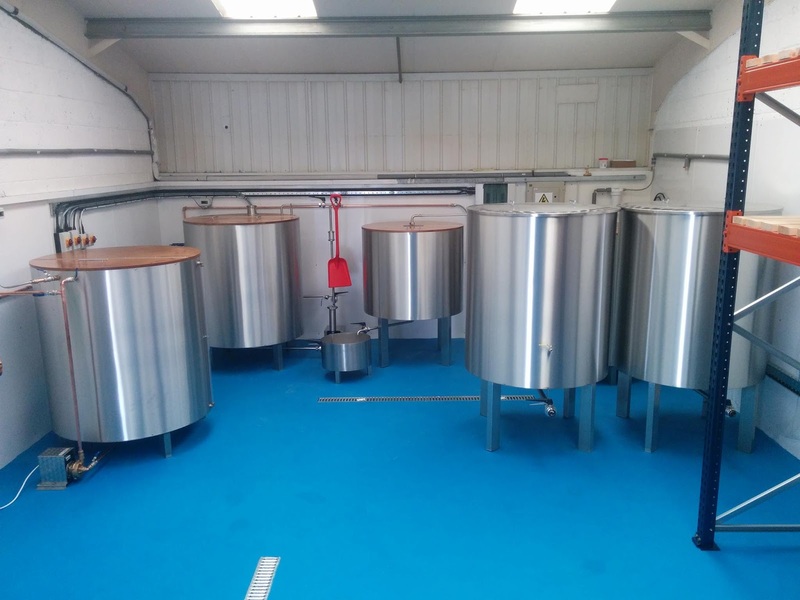 The first two instalments of this series of posts covered investment, products, branding, premises and the various permissions and registrations required to set up a brewery in the UK. This third and penultimate post will cover the build out with the final post of the series covering pricing, sales and administration along with a few things I've learned along the way so far. Having spent a lot of time visiting other breweries and discussing the various pros and cons of their set ups across most or all of these items, it became clear that while there may be some 'best practices' such as having drainage points close to brewing vessels and using IP65+ rated electrical connections as high up as possible, the design and layout is ultimately dependent on the unit you'll be building into and how the vessels will be laid out within that. One of the best tips we received was to make life-sized paper templates of the brewing vessels and lay those out on the floor, moving them around until the layout worked best within the space. While I had done this electronically before we got the keys, being able to visualise up close was invaluable and ultimately led to the layout being changed. The vessel location really does govern everything else, so spend time getting that exactly right. Once the vessel location was decided, the drainage and floor layout came into focus. 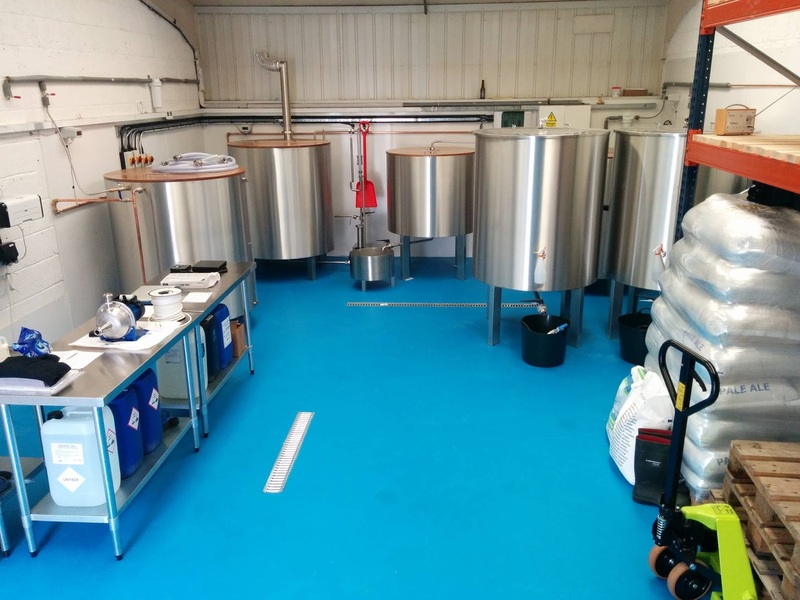 We got quotes for different options from a specialist brewery flooring firm but in the end it worked out a lot cheaper (less than half the price) to using a local builder/drainage firm to cut and install the channel we wanted, then a specialist resin flooring company to lay the resin. Once those items were completed, we were in a position to move the vessels out of storage and start on the electrical work. 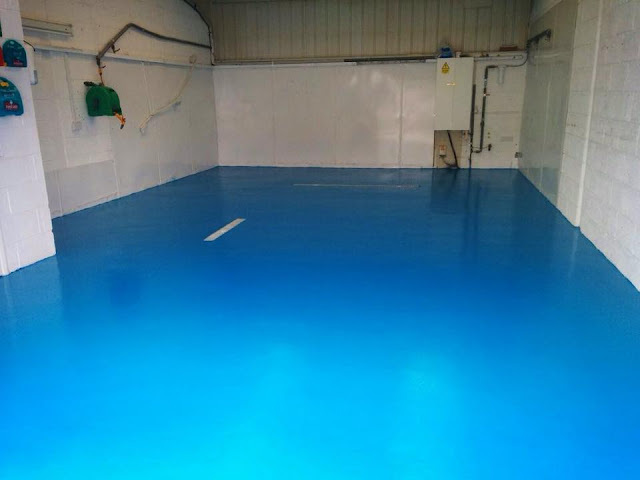 The photo below shows the unit just after the resin flooring was laid. Note the two drainage points running in different directions. Resin flooring laid up to two drainage channels, one in the centre of the 'wet area' and the other to the edge of the packaging area. The channel runs down to the front of the unit and connects to the foul waste egress point by going under the wall into the WC. You can also see the HLT and cleaning point connections to the right. With the flooring down, it was the turn of the electrical contractor. The paper templates were laid down again and connection points drawn in marker pen on the film that was covering the wall cladding. 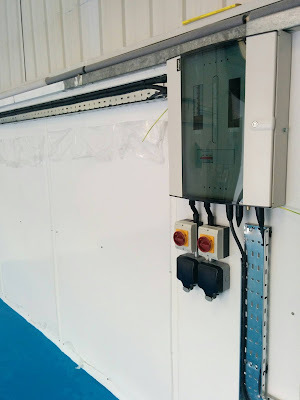 We had a separate breaker box installed that could be accessed easily between the HLT and mash tun. Two days later, work was complete bar wiring up the elements. 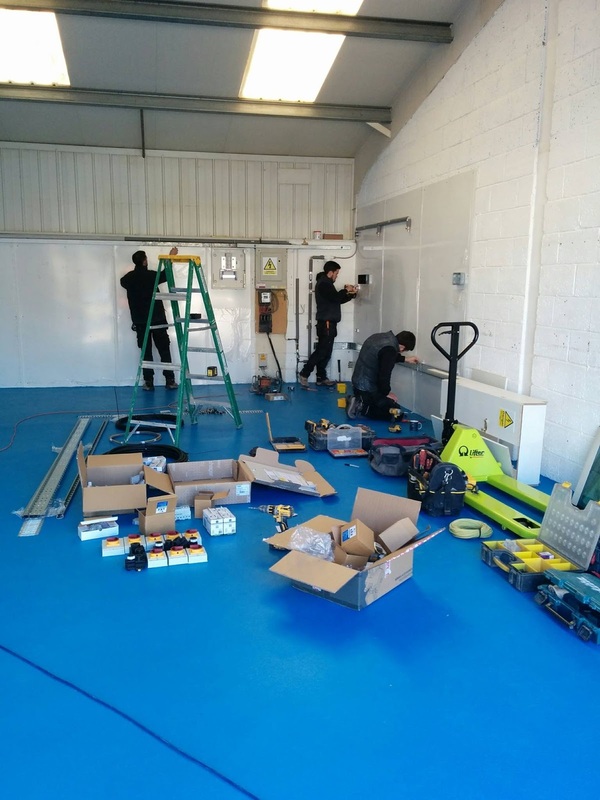 We installed the pallet shelving whilst the electricians were working. Next was moving the vessels into place, which was a fun day logistically. This involved using a local transport firm to drive the kit from where it was stored to the brewery. It was loaded and unloaded using a forklift (with me looking on nervously) then moved into place based on the design we'd set out with the paper templates. I had lots of help from friends that day, including Siren kindly lending us their forklift! The photo below shows the vessels in place. The following week we set about completing the brew house installation and running in the final water connections. This shot was taken on a Friday evening and I think it was about 10am Monday morning when we decided the layout wasn't quite right, with hindsight. The reason being that connecting up to the heat exchanger (in the very far left corner, left of the kettle you can just about see) would've required a lot more copper and plumbing and from where it was located, tricky plumbing at that. So, we decided to swap the location of the CLT and FVs so the CLT was adjacent to the heat exchanger. We were lucky in that at 5BBL, FVs are light enough to be carried, dragged and persuaded into location and the pallet truck was able to get under the heavier CLT. The photo below shows the brewery at the end of that phase. The final week of the build out saw us installing the work area, cutting the chimney hole, installing and connecting up the chiller and temperature controls, frantically ordering chemicals and ingredients and generally fretting about the upcoming first brew and various couplers and connectors we were still missing. 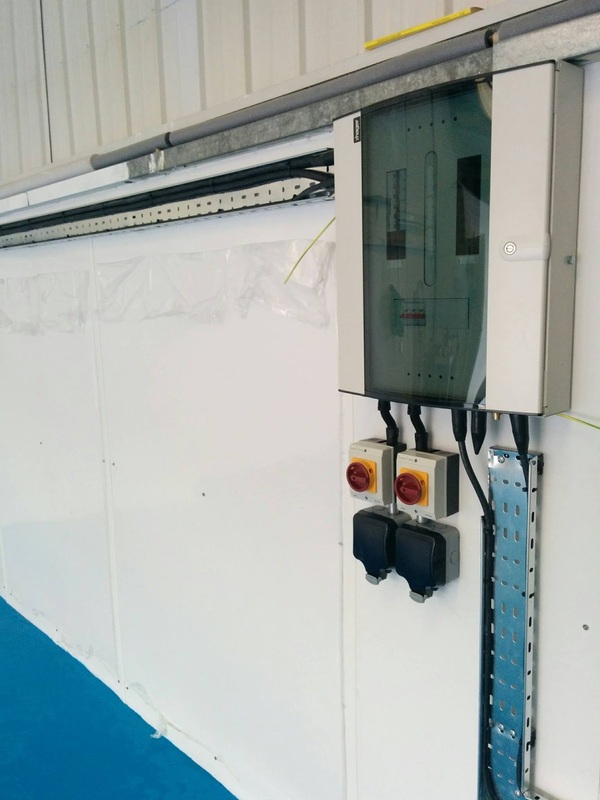 The photo below shows the completed installation. Visit lots of breweries and observe. The question to ask is: "If you could start from scratch with the design and layout, what would you do differently?" - I guarantee you any brewer will merrily talk for hours on this topic! Don't be afraid to change things around if they're not right as you progress with the build. Once everything is in place, it's nigh on impossible to change it and will involve down time. Part IV, the final piece in this series, should be up later this week. If you have any questions or comments, please do post them below! In the first part of this series of blog posts I covered a fairly broad range of subjects and ended with a question about addressing different markets. The response to that and other points raised in the post drew some incredibly helpful comments from the owners of a number of fantastically successful breweries, so I would recommend revisiting that post and having a read before continuing on here. In wrapping up that post, I suggested this second part would cover premises build-out, layout, pricing and sales. However, I'm going to stray slightly from that and focus instead on the administrative/permission side of setting up a brewery in the UK first. I received a number of emails from others in a similar position (or considering starting a brewery) that suggested to me that this might prove a useful area to drill down further into and also received some advice offline that I'd like to share as part of that. I'll cover premises build-out, layout, pricing and sales in Part III. Obtaining planning permission, or obtaining premises that already have B1C or B2. I'm not going to re-cover this below - contact the local authority to see what they expect and go from there! The process of registering is actually pretty straightforward and is completed entirely online. You'll need to provide the registered address of the company, names and address of directors and the number of shares each has etc. The process may be simple but in following it, you're signing up to some legal obligations so would do well to read up on those (e.g. requirement to submit accounts by certain dates or face fines). The place to go is here. I received my company number by email a couple of days after applying followed by lots of bumph in the post. 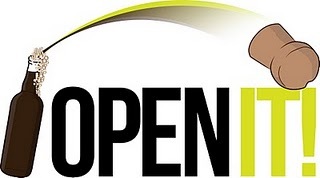 If you use your home address as the registered company address expect to receive your first junk mail a few days later! Also, be alert to spam callers from that point - I had one who sounded very convincing and timed it perfectly to try to deceptively obtain my electricity supply contract, no doubt with a nice commission for them. Now, you'd think trying to give a bank some money would be easy but you can end up jumping through a few hoops to open a business account including being credit checked and providing a good amount of personal information, especially if you'd like an overdraft facility etc. I started out by reading through the information available on Martin Lewis' excellent Money Saving Expert site which listed a few deals for free business banking for a certain period etc. I ended up going with my own bank and it just happened to be offering free banking to new business for a period of 18 months. Do read through the charges you can expect after that period - nothing is really 'free' in business! It took me about five days to open an account and this included an interview with an advisor who asked me a few questions about the cashflow forecast I'd submitted and also pointed out that I'd used Andy as my name with Companies House and Andrew in my banking application. Changing it on the application would have meant resubmitting the whole thing (yep!) but fortunately changing the director details with Companies House can be done online. For details of how and when (and if!) to register go here. You can elect to register voluntarily before you're required to but be aware that if you do, you're then automatically on the hook for the legal obligations as if you were required to register. I registered voluntarily once I'd paid for my brewery kit because VAT was charged and I'd like to claim it back along with any VAT paid out on during the build-out process. You'll be asked for the business bank account, company number, directors details and offered a number of options/schemes as part of the application process. Once you start, you can save your progress and come back so don't worry about reading up on something you're not sure about. Once the application was completed, I received my VAT number the next day. As part of applying you set up an account on a portal that you'll return to in order to submit returns etc. Tip: the login username is only shown once (a long number) so screenshot it! All breweries must be registered with HMRC by law and are required to pay duty on what's produced. The notice that covers this is Excise Notice 226: Beer Duty and reading that from top to bottom is a good place to start! The document covers the application process towards the end. You'll need to copy the questions into a new document and provide answers as required, attaching the required supporting information which includes a plan of the premises where duty suspended produce will be stored. I've had a few tips from others here including something relatively new whereby HMRC will visit you and interview you as a matter of course (this used to be at their discretion). They'll ask to see your brewery premises, the equipment and details of how you're planning to monitor and track the amount of duty you should be paying once you're up and running. I actually submitted my application today so can't write about my personal experience yet. The application also asks for your VAT number and company number so you should look to complete those processes first. All limited companies must register for corporation tax. This is the tax you pay on profits of the company and requires you to submit audited accounts according to a schedule set based on your first accounting period (determined based on when you register). Everything you need to know is covered here. Again, there are legal obligations here. If you're not comfortable with them it's probably best to speak to a small business accountant. Breweries are now assessed under the same guidelines as food producers and you can expect to receive a visit from an Environmental Health Officer once you notify them that you're producing beer. When and how to do with this will vary depending on the local authority so contact the local council to discuss it with them. Most will assess under the Food Hygiene Rating scheme and you'll receive a rating like any food production facility might. You'll need to contact your water supplier to discuss their requirements here. 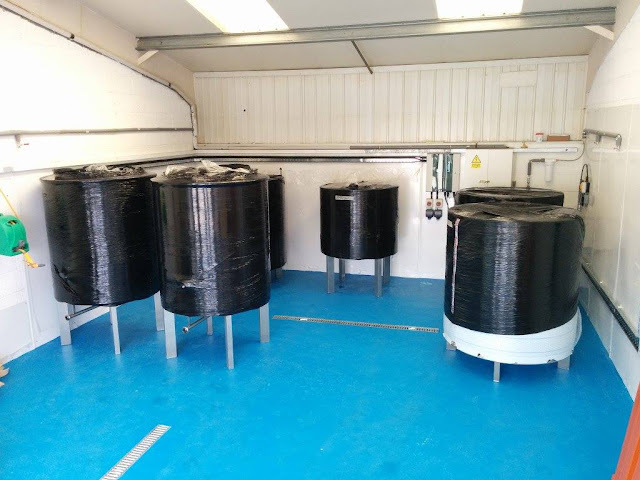 Since breweries produce waste that requires treatment you'll need to register with your supplier and they'll charge you based on the volume you expect to discharge and the type of effluent you're discharging. Some breweries I've spoken to are visited periodically to have samples taken for analysis. The permit application process for Thames Water is covered here. The Alcohol Wholesaler Registration Scheme introduces a requirement for anyone who sells, offers or exposes for sale or arranges to sell alcohol to other businesses on or after the point at which excise duty is payable, to be approved by HMRC. This is a new scheme which is covered by Excise Notice 2002. I plan to register for this once I've completed my duty registration. Note that in future, you'll be required to check that anyone you sell alcohol to is also registered, if they'll be selling on to others (e.g. distributors). All small businesses should have insurance to protect them against theft, loss/damage and public liability. This isn't something I have in place yet but will look to do so before I start trading. It's also likely your building lease will be issued on a repairing basis - that is, you're liable for repairs to any damage that occurs during your tenancy. This may be worth considering as part of insurance coverage too. So that's the end of Part II of this series of posts - perhaps duller than Part I but hopefully interesting and useful to some! Breweries - is there anything you can add to the above? Please do pitch in and share your experiences of the above processes and any tips you can offer! 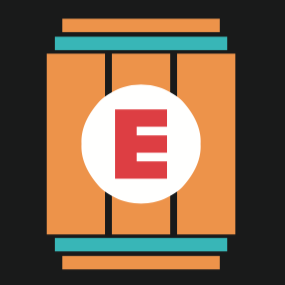 Back in August of last year, I finally bit the bullet and decided quit my job to focus on opening Elusive Brewing. As I wrote back then, the decision was partly driven by being at breaking point with my job but deep down I knew that unless I took this positive step, it was too easy to keep putting things off and watch the weeks trickle past. Since leaving that job in September, I've been doing many things including relentlessly chasing and ultimately having to give up (again) on the premises we were so close to securing in Basingstoke, finding and agreeing terms on new premises in Finchampstead, visiting as many breweries as possible to gather ideas and learn from others' experiences of starting a brewery, gaining further work experience at Weird Beard, brewing three collaboration beers, completing a BrewLab training course at Wimbledon Brewery, developing and honing recipes to work within the parameters of the ingredients we can access, developing a marketing strategy (of sorts) and finally, setting up the business side of the limited company we'll operate under including planning budgets, drawing up cashflow forecasts and sorting out business banking and the various registrations. This first post is going to cover three areas: Investment (and budgeting more generally), Premises (identifying) and Products & Branding. The highest cost above is probably going to be the brewery itself but the rest of it will soon add up. Without revealing my (and more specifically my suppliers') hand(s) fully, I've actually budgeted 3x the cost of the brewery as a total startup budget. This budget includes the work required on the premises and, well, everything else. That figure wasn't plucked out of thin air by the way - it's what I've worked out I'll need with a reasonable buffer added in. Others I've since discussed this with had done it for (in some cases much) less and of course there were breweries who'd spent more. The first challenge, of course, is to raise those funds. The brewing equipment manufacturer will likely require a deposit up front and the rest on shipment. The rest of the spend will come later but it won't be particularly spread out either, so be prepared for it. 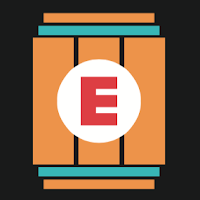 Elusive will be tiny initially, with a maximum throughput of 5BBL or 800L per week (that's 18x9G casks, 26x30L KeyKegs or 2400x330ml bottles). That hard-limits potential revenue and therefore fixed costs need to be kept in check in order to attain cashflow positivity within a reasonable period and, more importantly, maintain it. Actually, that's kind of a balance and one I pondered for a while. The main fixed costs are rent (plus any associated maintenance/service fees) and business rates - oh, and wages of course! Other costs are variable based on throughput and can be turned down if sales are slow but the bottom line is some large costs are fixed and you'll need to pay them no matter how little or much you're selling. The balance, or maybe 'trick' is a better word, is to maximise potential throughput (and therefore revenue) for the fixed cost but a third dimension is labour capacity, because it's all well and good being able to double brewing capacity within your current space but you'll need more man hours to do it and Elusive will be starting as a one-man operation - although I'll have some part-time support from friends and family, thankfully! So with a view of your fixed costs, variable costs and brewing throughput (potential revenue) you should start to model cash flow for various levels of sales. What happens if sales are only half of what's forecasted? Can you still meet your fixed costs? Certainly, if you're looking to take on external investment or loans, you'll need to have that modelled carefully and be prepared to talk through it in great detail. Conversely, this model will also drive pricing (and to an extent, vice-versa) but that's something I'll cover in a future post. This is something I feel I could write a book on already and yet, at time of writing, I still don't have keys to an industrial unit. For most breweries I've visited, premises was the single biggest headache in getting started and it'll take at least double the length of time you thought it would. It's a crucial aspect to get right, of course. Size, cost, location, ease of access and suitable utility connections are all very important. The first concern, however, should be the use class. This governs what the premises can and can't be used for. A small brewery would generally fall under B2 (industrial) but may also be covered under B1c (light industrial) depending on the local authority. Before putting an offer on any premises, it's imperative to check the current use class and consult with the local authority to confirm this covers your use. They may ask some questions about what you'll be up to and there's a good chance they won't know anything about brewing, so be prepared for that. Use classes can be changed but that usually requires going through the local authority's planning process and can be very time consuming. The next considerations are rent and rates. A private landlord or local authority will likely want to enter into a fixed-term lease - 3 years is typical although you'd be wise to negotiate a break clause so you can get out if things go really well or indeed, if they don't! They'll have a rental price in mind they want to achieve over that period and you'll need to find out what that is by negotiating. They'll also want a deposit (3 months is typical) and most likely, the first quarter's rent in advance, although everything is negotiable of course. Ask if they'll be charging you VAT too. The advice I got was that this can sometimes be hard to claim back depending on the rental structure, so bear that in mind. Rates are set by the local authority and you can check the VOA website to see the rateable value of any premises you're considering and based on that, what you'll be paying to the council and when. Finally, you'll need to instruct a solicitor to act on your behalf during the lease process. They may advise you to conduct land searches etc. which will add to their labour costs. You may also be liable for the legal fees of your landlord and their agency fees - be sure to ask about all of this when negotiating! I'll cover premises build-out in a future post. Unless you're taking occupation of a former brewery site, you'll likely have a good amount of work to complete before the equipment can be moved into place. Brewing is very much a growth sector in the UK at the moment with the number of breweries having grown significantly over the past 2-3 years. Conversely, the number of pubs is decreasing, so more breweries are competing for fewer overall customers. As a small brewery, your costs per barrel will be significantly higher than the big brewery in the area (and especially the regionals/nationals) so you'll certainly have to work hard to establish a customer base. Of course, demand for 'artisanal' products with more flavour and a story behind them is partly what's driven the 'craft' brewing boom in the UK, so it's not all bad news. The best advice I got here was to absolutely focus on making the beer the best it can be. If your product is going to be more expensive than the brewery down the road it needs to be simply better, or more interesting, or have a local connection - something to make pubs want to buy it and drinkers want to drink it. If quality isn't great, you might sell the first few batches but you can be certain those customers won't come back for more. This is something I've been very conscious of when setting up Elusive. Frankly, the thought of getting it wrong it terrifies me. During the recent boom I've come across many breweries who've learned at their customer's expense - shipping beer that wasn't quite right, apologising (or not) and working to improve things with the next batch. Some have certainly improved and gone on to succeed but in an increasingly crowded market, if anyone's going to be squeezed it'll be a brewery shipping bad beer. Any successful small business needs a good product to build a market with and a brewery is no different. There's no longer 'build it and they will come' route to market for small breweries. A secondary consideration for me is that with Elusive, I'll be aiming at two markets and they're a bit different. The first is the local cask market and the second is a wider 'craft' keg and bottle market. With that in mind, I've been putting a lot of thought into which beers might work best in each of those markets, especially the local one. One thing I did was brew prototypes and circulate them locally for feedback - some was positive and some less so, but it was all valuable input. The main point here is I'm making no assumptions as I can't afford to just make something and hope it works. Yes, I'm doing this to brew beers I want to brew but ultimately if I want a local market, I need to find something that works for me and my potential customers. On branding, from the outset I've wanted something fun and vibrant. I think we've got that aspect of it right but again, I won't be afraid to take feedback on board if it we find bits of it don't work in practice. The beers I hope to sell locally will have a local connection in the name and pump clips but we don't want to the brand to be the limiting factor to wider appeal, so balance is required. Have you had to take into account addressing different markets and did you produce different beers for each or find something that works in both/all? 'Market' here could mean cask versus keg/bottle or anything you like, really - I'm curious to know if other breweries used similar approaches or just put beer out and went with the flow! In Part II, I'll cover our premises build-out, layout, pricing and sales. I might even include some photos of our progress to help break the monotony of my rambling!